It can be tempting to create a rainbow of riotous shades in container gardens, but are they as pretty as you imagine? Too many colors can be distracting and disjointed, giving your containers a haphazard, messy look. Instead, create a unified look in your container plantings by selecting two or three colors, rather than trying to use as many colors as possible. Multiple containers using the two or three color guideline will create a more dramatic effect on your deck or patio as the color masses are more pleasing to the eye. Shaded areas can appear brighter by using light-colored plants. Try light pink, light yellow, lavender, pale blue and white flowers in lower light areas. Also consider foliage and grasses with light variegations or patterns that can seem to glow in dimmer locations. 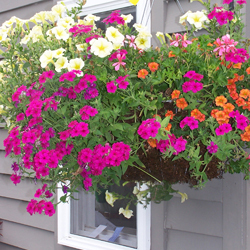 Containers in the full sun, however, can handle brightly colored flowers, whereas pastels will appear faded and washed out in bright sunlight. Use bold colors in reds, oranges, bright yellows, deep blues and purples in sunny spots, and choose foliage options with rich, deep hues. Basic color theory can help you create the color effect you may be looking for in your containers. Harmonious colors are next to each other on the color wheel and have a soothing effect. These color combinations include blue and violet, orange and red, and orange and yellow. When combined in a container arrangement, they have a very well coordinated, blended look with understated elegance. Complementary colors are opposite from each other on the color wheel. 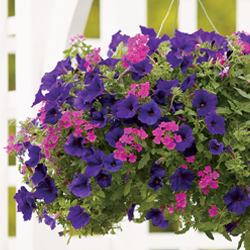 These are high in contrast and add drama and excitement to your container garden. Vibrant combinations include yellow and violet, orange and blue or green and red. These are especially good options for any area that needs a bold pop of color. A monochromatic color scheme is composed of plants of the same color. Create extra interest in a monochromatic container by using a mix of tones or shades of the same color in addition to various textures, shapes and sizes. Take care that the different hues do coordinate, however, or you may end up with a clashing mix that doesn’t look quite right. White flowers are in a class by themselves. They blend well with most colors and can provide a transition between colors that do not normally work well together. White flowers or white-edged foliage can create a beautiful display in containers in the evening when combined with well-placed, soft lighting, ideal for a nighttime garden. 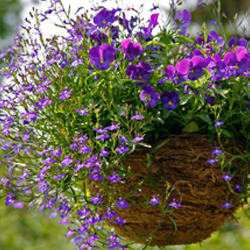 When working with color combinations, don’t overlook the color of your pots and planters. Use the same color theory guidelines to coordinate between pots and plants, or choose more neutrally-colored planters to ensure the plants are the ultimate showstoppers of every container. With well chosen colors, every container can look amazing.